The world’s largest producer of chrysotile asbestos is now marketing its signature product with President Donald Trump’s image, according to a recent Facebook post from the Russian mining company Uralasbest. On June 25, the company, which operates a giant asbestos mine in the Ural Mountains in Western Russia, posted photos of its asbestos on palettes wrapped in plastic and stamped with a seal of Trump’s face in red ink. A message of support for Trump and former Environmental Protection Agency (EPA) administrator Scott Pruitt accompanied the photos. In an English translation provided by the Environmental Working Group, the Russian mining company praised Trump for his outspoken support of asbestos. A loose translation generated by Facebook backs that interpretation. “Donald is on our side! … He supported the head of the United States Environmental Protection Agency, Scott Pruitt, who stated that his agency would no longer deal with negative effects potentially derived from products containing asbestos. Donald Trump supported a specialist and called asbestos ‘100% safe after application,’” the translated post reads. Before resigning as the head of the EPA last week, Pruitt led a push to exclude legacy uses of asbestos from the upcoming evaluation of the toxic mineral under the Frank R. Lautenberg Chemical Safety for the 21st Century Act. Asbestos, known for its durability and resistance to heat, was used extensively in the U.S. for much of the 20th century. It is now infamous for its link to serious respiratory diseases such as mesothelioma, lung cancer and asbestosis. The fibrous mineral is regulated but not banned in the United States. According to a 2017 study by the Asbestos Disease Awareness Organization and EWG, the U.S. imported an estimated 705 metric tons of raw chrysotile asbestos in 2016. Trump has long been critical of the push to ban asbestos in the U.S., often publicly praising the toxic mineral. In a 2005 U.S. Senate Committee on Homeland Security and Governmental Affairs hearing, Trump called asbestos “the greatest fireproofing material ever made.” In a 2012 tweet, he blamed the collapse of the Twin Towers on 9/11 on the lack of asbestos in the buildings. “I believe that the movement against asbestos was led by the mob, because it was often mob-related companies that would do the asbestos removal. Great pressure was put on politicians, and as usual, the politicians relented,” Trump wrote in his book. While asbestos is relatively safe when left intact, it becomes deadly when disturbed during renovations or demolitions. Aging buildings containing asbestos materials also pose a risk to human health, and disasters, such as fires and hurricanes, can release toxic fibers in the air. According to a recent study by the International Commission of Occupational Health, occupational asbestos exposure led to diseases that killed 39,275 people within the U.S. and more than 222,000 people throughout the world in 2016. Russia Could Become Lead Supplier of Asbestos in U.S. The U.S. is one of the only industrialized countries in the world not to have a comprehensive ban on asbestos. Brazil has long been the United States’ main supplier of raw asbestos. Of the 705 metric tons imported in 2016, an estimated 95 percent was imported from Brazil, with the remaining 5 percent coming from Russia. The majority of imported chrysotile is used by the chlor-alkali industry in the chlorine-making process. A recent ban on the mining, use and sale of asbestos in Brazil leaves an opening in the market, and many anti-asbestos advocates fear Russia may fill the void. Uralasbest operates a mine in the Russian city of Asbest, once known as the “dying city” for its high rate of lung cancer and other diseases. The massive mine covers an area nearly half the size of Manhattan, measuring seven miles long, a mile and a half wide and 1,000 feet deep. Russia, the world’s largest producer of asbestos, generated more than 2 million metric tons of the toxic mineral over the last two years, according to the U.S. Geological Survey. In a press release quoted by the Center for Public Integrity, Andrei Kholzakov, the chairman of the Uralasbest union, has reached out to Russian President Vladimir Putin for help fighting potential bans against chrysotile around the world. “[Putin] promised to support Russian producers of chrysotile, especially in situations where we find ourselves under political pressure at the international level,” Kholzakov said. Rosenberg, E. (2018, July 11). 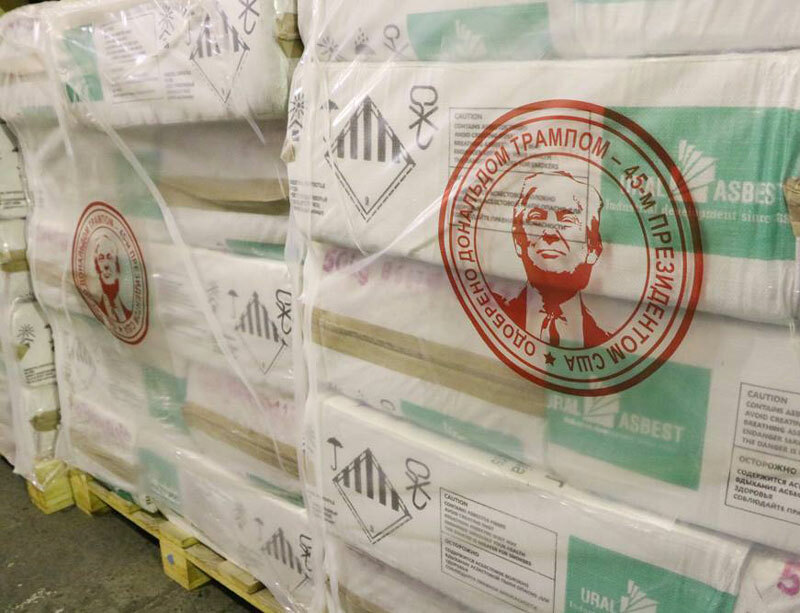 'Approved by Donald Trump’': Asbestos sold by Russian company is branded with the president’s face. Formuzis, A. (2018, July 11). Russian Asbestos Giant Praises Trump Administration Actions to Keep Deadly Carcinogen Legal.